In recent years, the number of Chinese citizens of outbound tours has experienced a rapid increase of nearly 10 million person-times each year. In 2012, this number exceeded 83 million person-times, becoming a new highlight and driver in China's external exchanges and relations. Chinese citizens traveling abroad should conduct good manners, follow the customs and practices of the local people, local laws and regulations and discard bad habits to demonstrate good personal qualities and conscientiously fostering a good national image. This should be a code of conduct followed by all Chinese citizens. Promoting good manners depends not just on awareness-raising by the citizens themselves but also publicity campaigns and efforts led by the government. In particular, we should strengthen the introduction and advice on customs, laws, regulations and public services of foreign countries. This will help Chinese citizens to get in-depth knowledge about their destinations before travel, create an awareness of good manners and enable them to go to a foreign country well-prepared. The UK is one of the most popular destinations for Chinese tourists. Nearly 1 million Chinese people enter the UK each year. The Chinese Embassy in the UK works to help Chinese nationals know the UK better, encourage them to follow the common practices and enjoy a peaceful and enjoyable time in Britain. To this end, in addition to providing daily consular protection and assistance, we have actively explored the use of various platforms to create new ways of public education and advice. By integrating all types of resources, we have established a network for information release and consultation via website, videos, mobile phones and micro-blogging. The Embassy has also joined hands with telecommunication operators to design and send special SMS messages to encourage good manners and safety to Chinese citizens, making such information easy to receive, remember and use. These SMS messages have achieved satisfactory results and warmed welcomed. Since the beginning of the year, the Embassy has launched a series of events to deliver consular services in cities and on campuses. Our staff members have traveled within consular district to disseminate important and practical knowledge to overseas Chinese and students concerning their stay in the UK. These events have effectively improved their awareness and ability to practise good manners and stay safe. Improving the image of Chinese citizens abroad requires everyone's efforts. 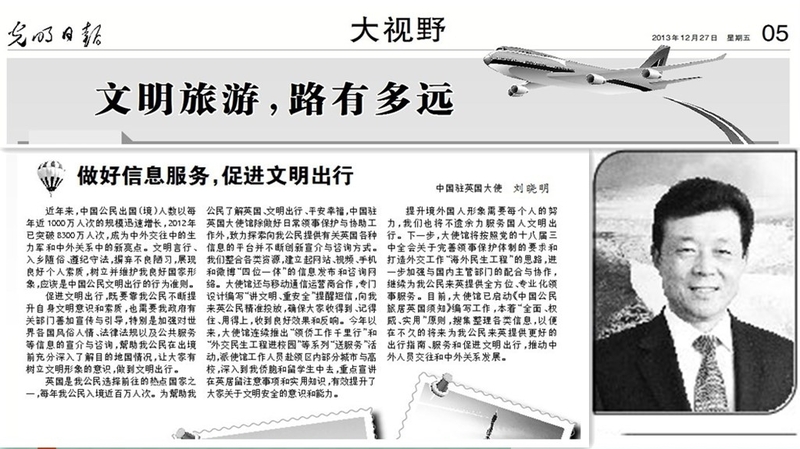 We will work hard to help Chinese citizens going overseas keep good manners. For the next step, the Embassy will act in the light of the requirement of the Third Plenary Session of the 18th CPC Central Committee on improving consular protection and wellbeing of Chinese citizens overseas, strengthen cooperation and coordination with competent departments at home and continue to offer comprehensive and professional consular services to Chinese citizens in Britain. Currently, the Embassy is working on the compilation of Dos and Don'ts for Chinese Citizens in the UK, where authoritative and practical information is put together. We believe that in the near future such information will enable us to offer better travel guidance and services to Chinese citizens visiting the UK, fostering good manners of Chinese citizens, and contribute to people-to-people exchanges between the two countries and the growth of China-UK relations.